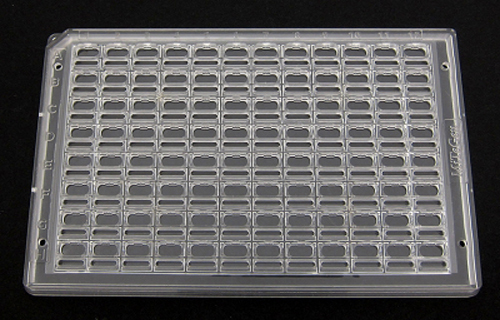 MiTeGen LLC, a provider of consumables for X-ray diffraction, crystallography, and protein crystallization for academic, pharmaceutical, industrial, and government research, has launched a crystallization microplate made of TOPAS cyclic olefin copolymer (COC) from Topas Advanced Polymers. MiTeGen’s new In-Situ-1 crystallization plate uses TOPAS COC for its superior moisture vapor resistance and X-ray transparency compared to competitive thermoplastics like polyethylene terephthalate (PET), polystyrene (PS), polyethylene (PE), and polyimide (PI). MiTeGen’s In-Situ-1 crystallization plate (an SBS standard, 96-well microplate) enables X-ray crystallography researchers, who study the atomic-level structures of biological samples, to grow and screen crystals of their targets. The advanced features of the low-profile plates, rarely seen in a crystallization plate, allow for samples to be easily grown with more reproducible conditions, and sub-sequentially studied via X-ray diffraction in situ, according to TOPAS. This means that researchers can now learn about the inherent quality of their crystal samples without having to manipulate or manually retrieve them, which can often cause undesired changes or damage to the samples. The crystallization plate is an injection molded COC frame combined with a thin extruded COC film, generating a two-piece system with the performance benefits of both parts. The molded rigid frame (128x85mm) allows for physical features such as ledges and channels that provide consistent results from experiment to experiment. The thin (100µm thick) film bottom which is ultrasonically welded to the rigid frame, provides a surface for crystal growth drops to be dispensed and easily analyzed over a broad spectrum from visible light to X-rays. The high-flow characteristics of TOPAS COC enable extensive detail to be designed into the In-Situ-1 crystallization plate, explained the material supplier. Due to its high purity, TOPAS COC also has lower leachables and extractables than competing materials, resulting in the most reliable and repeatable results. The inert nature of the material prevents interference with reactions and analyses. Other important features include superior optical (92% clarity) along with high UV transparency and low birefringence. MiTeGen is exploring the use of TOPAS COC resin in other crystallization plate products and sample holders. A new plate geared at the crystallization of membrane proteins in lipid cubic phase will soon be launched.